Couple Looking for Fun We are into wicked clowns. 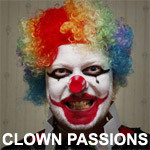 We love the horror aspect of clowns. I haven't been to a circus though since I was around 8yrs old and he has never been. Anyway, we are looking for a woman to have fun with or at least for me to have fun with! Does biraciallove857 belong in this group? Does zhawanoekwe belong in this group?